This job took place in a property in Elstead, Surrey. 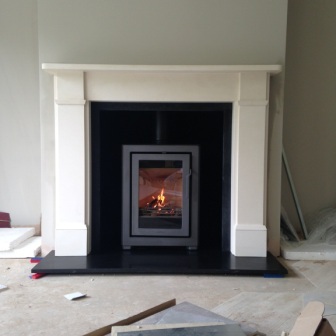 The Contura i4 FS modern stove from Sweden was the exact choice of our clients. Contura i4 FS Modern is designed for burning wood or smokeless fuel. It is easy to switch between fuel types. Finally, along with the new limestone mantel and slate hearth, this was a very attractive installation. If you are thinking of installing a stove in your property, contact The Billington Partnership and we will happily run through your requirements.